With iExplorer HD, you can manage/view files on your remote servers (Windows sharing server/FTP server/WebDAV server/SkyDrive/Live Mesh/Google Docs/CloudMe/DropBox/Box.Net …) in home, office and anywhere. 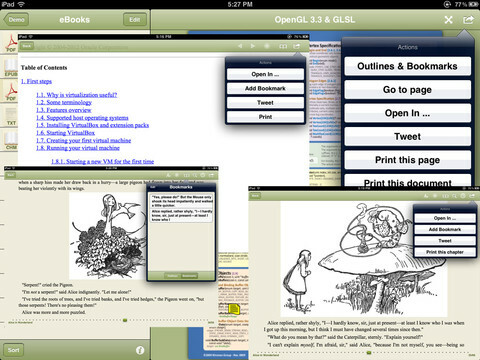 iExplorer also is a good eBook reader, media player, photo viewer, and work assistant. You can read CHM, ePub, PDF and large text/PDB files with outline/bookmark/annotation support, play musics and movies without copying them to your device, view large photos on your PC/NAS and share to friends, edit spreadsheets on your Google Docs and save them as different formats, print any viewable documents. iExplorer HD v2.0+ is totally rewritten from version 1.x. It improves a lot in User Interface, usabilities and functions. Please send mail to us if you encounter any problems, because we cannot reply your comment on App Store. * Edit Google spreadsheet, download google docs as pdf, Microsoft office document, zip, image, open office document, text files and so on. * Open files in other apps. Open file from Safari, Mail and other apps. * Print & tweet any viewable documents/ebooks (Printer needs support AirPrint). * Embedded PDF viewer, support outlines, bookmarks and annotations.